There are as many different gaming headsets out there as there are different types of gamers. One of the latest notable entries comes from Kingston, who recently launched the Hyper X Cloud II Gaming Headset, which is a new virtual 7.1 surround sound headset and mic for the PS4, Xbox One and PC. Does Kingston’s new headset set itself apart from the pack? Upon opening the Hyper X Cloud II box, I could tell right away my ears where in for a treat! Kingston has been a big name in PC gaming for many years now, so our expectations were fairly high. The memory foam on the ear pads and head band make the Cloud II very comfortable and the metal bands connecting the headband to the ear pads make for very solid construction — unlike the comparable-priced Turtle Beach headsets I’ve found to be all plastic. They also come with interchangeable ear pads so if you don’t like the feel of leather they can be switched to a very comfortable cloth pad. The USB interface for PC that has separate controls for the microphone and main volume as well as a 7.1 button to enable the virtual surround makes for very easy use on PC. There are no drivers required to work on PC, and the first time I plugged the headset into my PC, all I had to do is go into my audio settings to switch my default audio device to my headset. Not much documentation comes with the headset to provide help with troubleshooting, and I’d expect that many PC users expect devices to automatically work as soon as they are plugged in. The setup for the PS4 was pretty simple as well. The USB piece for the PC can be removed and then plugged into the PS4 controller directly. Once in the controller, users go to the device settings and tell the console to send all sounds to the headset in the controller. That’s it! No USB plug to play with, no extra cable to plug into a receiver or TV. I had the headset up and running in about 30 seconds on my PS4. The Xbox One does require the Xbox One headset adapter, and as you may or may not know, this has not always been the case with other headsets on previous consoles. 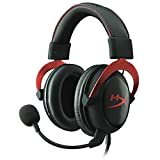 Now, the million dollar question, does the Hyper X Cloud II Gaming Headset sound good? The short answer, yes. For the most part the sound produced by the headset sounds great. The ear pads are large enough to cover my giant ears, and do a reasonable job of passive noise cancellation. My wife has smaller ears and they fit very comfortably on her as well. The high, and mid-range frequencies sound very good. However it feels like the headset is EQ’d with voices in mind so the mid-low to low frequencies are not as pronounced. The 7.1 virtual surround sound is also not very distinct. When playing on the PC there is a button on the USB dongle to toggle the surround sound. When turned on, it sounds like all it does is add some reverb, and the overall surround sound experience does not feel defined. Another small caveat, the USB dongle for the PC controls the system volume in Windows, it doesn’t control its own volume. This would have been nice as, the average PC user expects to plug in a headset to use instead of speakers, and then when removed, the speakers should be at the same volume level as when the headset was plugged in. An optional software package from Kingston would have been nice to be able to control the volume level and EQ independently of the Windows system level. If you are a serious audiophile, this headset is not for you, however, for gaming purposes, this headset looks, feels and sounds great. Overall, the Hyper X Cloud II Gaming Headset is a solid headset for gamers. The construction, feel and sound are all good, and the hardware easily gives Turtle Beach a run for its money even if you only use the stereo setting. Kingston has done a great job with the product, and you would be hard pressed to find a better headset for the same amount of money.